Video Converter Assist is an easy-to-use media conversion application, which allows you to convert video and audio files among MP4, FLV, AVI, WMV, MOV, MP3, AAC, M4A, WAV, WMA, OGG, FLAC, etc. Just a few mouse clicks and you can convert your video/audio files for various media players and multimedia devices. Convert popular video and audio files from one format to another. Fast converting speed and excellent video quality. Convert any video files to popular media formats, such as MP4, FLV, AVI, MPG, MPEG, WMV, MOV, H.264, 3GP, SWF, RM, RMVB, M2TS, MTS, MKV, TS, ASF, VOB, DV, WebM, OGV, etc. Convert any audio files to MP3, FLAC, WAV, AAC, AC3, M4A, WMA, OGG, MP2, RA, MKA, etc. Convert videos to HTML5 video formats (OGV, MP4, WebM). Extract audio/sound or background music from your favorite videos and save them as MP3, Wave or FLAC files. Convert video and audio files from one format to another at ultra-fast speed and without quality loss. Convert video to iPad, iPod, iPhone, PSP, PS3, Xbox, Apple TV, mobile phone, MP4 players, Windows Phone, BlackBerry, Microsoft Zune, Android mobiles & tablets, etc. Convert video for YouTube, Facebook, Twitter, Vimeo, Dailymotion, Flickr, Dropbox. Convert multiple video or audio files at one time. 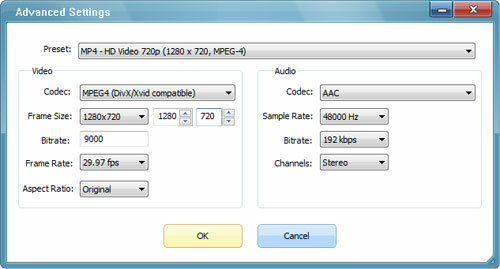 Screenshot 1: Convert audio and video files to various popular formats in just a few mouse clicks! Screenshot 2: Change these settings or use the predefined settings to get the best video quality! "A great product indeed! I got it recently and it is absolutely amazing compared to other converters. As a computer novice, I know nothing about sample rate, bit rate and frame size. This program automatically choose the best video settings so I can convert my video files in a super easy way!" "A powerful tool that will not only lets you convert videos from .avi to .mp4 format. Audio extraction is also one great feature that I usually use. Value for money!" "Congratulations to the people from Top Password Software for another good program, a program without bugs that runs perfectly." 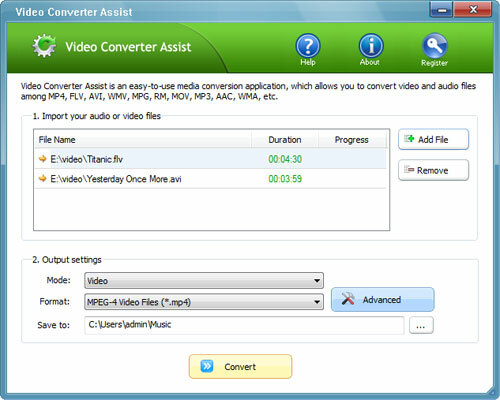 Learn How to convert your audio or video files with Video Converter Assist.